By the grace of God and the intercession of the Immaculate Virgin Mary, AMEN is a single-issue group focused on defending the Sanctity of Life. AMEN exists to defend every life from the moment of conception to natural death and to put an end to abortion once and for all. As long as we draw breath, we will do everything in our power to accomplish these goals. 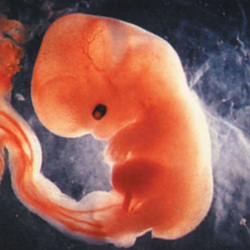 We are opposed to the destruction of human life in all its stages. Thus, we believe that any attack on innocent human life from its beginning until the moment of natural death is unethical. There are no exceptions. After deciding we should form a Pro Life group in our area I was throwing ideas of names around when Abortion Must End Now - A M E N came to mind. I immediately phoned my Mom to get her opinion. She said she liked it, but still I thought we may come up with something better. Within hours of coming up with AMEN, sitting in Mass and I heard the Lector say, "AMEN, I say to you." I thought, "OK, that was a coincidence." when just about that time another, "AMEN, I say to you." Chills immediately ran through my body. I instantly knew that AMEN was not something I cleverly thought of. AMEN was Divinely inspired by our Lord himself. He has asked us to do our part to work to end abortion, Matthew 25:40, "AMEN, I say to you whatever you did for one of these least brothers of mine, you did for me." We ask you for your prayers for an end to abortion and for AMEN. May we always act pleasingly to the Lord and work for His Greater Glory. We ask you to join us in this fight for life.